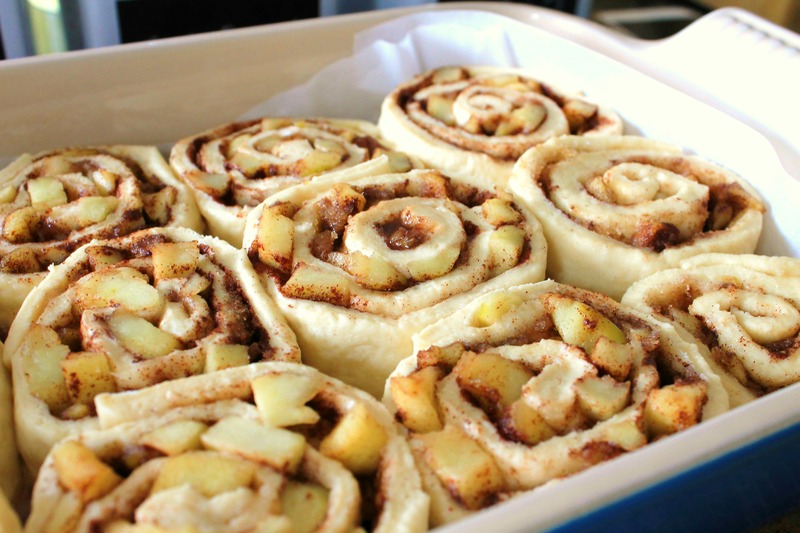 Apple Pie Cinnamon Rolls – Classic cinnamon rolls are kicked up a notch with the addition of diced apples and fall spices to make these taste just like fresh apple pie. Perfect for any breakfast or brunch, especially during the holidays! If there’s one thing I’ve learned about my husband’s taste in sweets, is that he’s as traditional as you can get. He loves apple pie, chocolate chip cookies, vanilla ice cream, and cinnamon rolls. 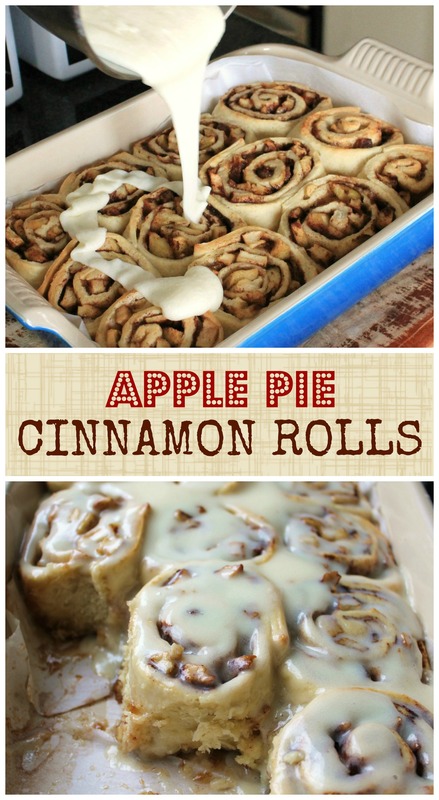 So when I saw this recipe pop up on Pinterest for these Apple Pie Cinnamon Rolls,I knew immediately that I was going to make these for Tyson. I mean, it has two of the four desserts he loves the most, combined into one! It can’t be more meant to be than that. Well, maybe if it also had chocolate chip cookies and a scoop of vanilla ice cream. But that’s out of control, even for him. 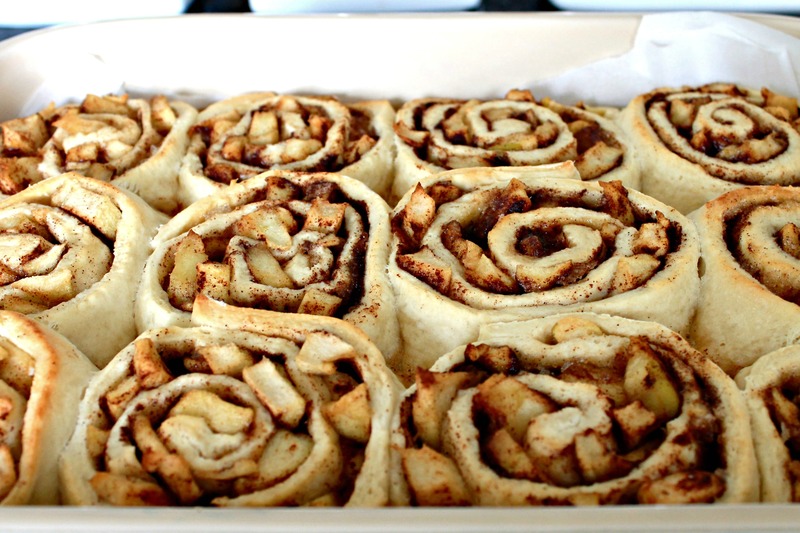 So Apple Pie Cinnamon Rolls it is! I’ve made cinnamon rolls a couple times before. Each time, I get impatient and don’t let the dough proof properly. How the heck am I supposed to wait two hours for the dough to rise once, roll it into cinnamon rolls and then proof another two hours?! It’ll be lunch by the time I finish these. It’s not shocking to understand why the rolls came out slightly tough. This time I was determined to give the dough enough time to rise (twice!) 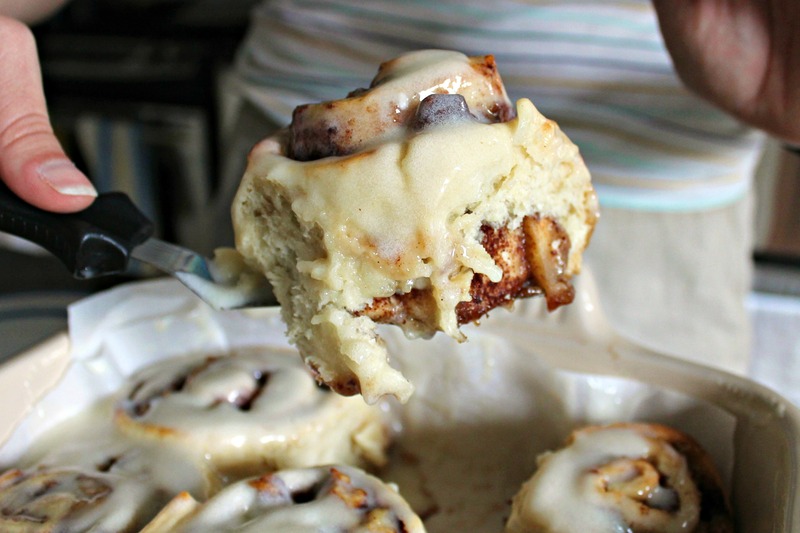 because I crave that soft, chewy, delicious feel of traditional cinnamon rolls that I can’t seem to master. And OMG, did these rolls come out amazing! The dough was moist and chewy, but soft and fluffy at the same time. The moisture from the apples created a syrup at the bottom of the rolls that was absorbed during baking so there was sticky sauce all throughout. The apples retained some texture so they were al-dente and not mushy. This is definitely going into the vault of best things I’ve made. EVER! After you cook the apples, make sure you drain them as much as you can. This eliminates the excess water that they have. 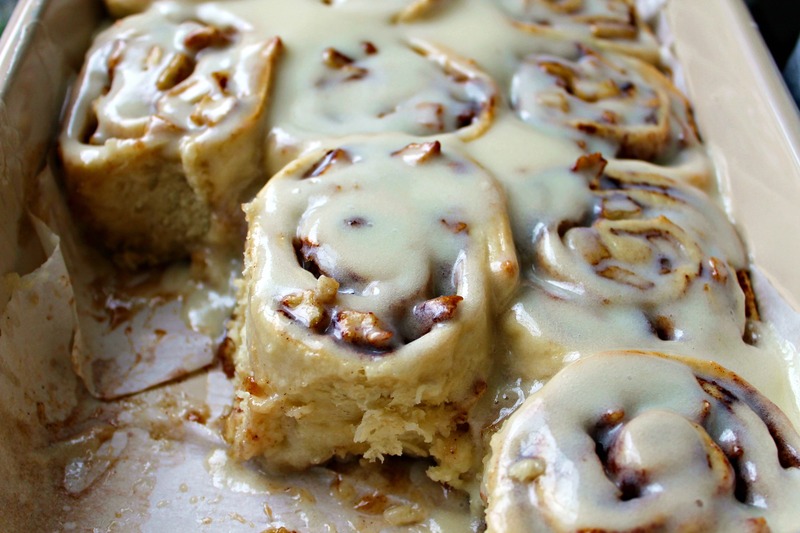 Too much water will drown these cinnamon rolls. Even after I drained them, about an inch of water collected at the bottom on the pan before cooking. Any more than that would have been baaad news. Make sure the milk for the dough is scalded, don’t just warm it. To scaled milk, heat it to medium-high heat until bubbles start to appear around the edge of the pot. Remove from heat and let it cool until warm. Don’t put the hot milk into the dough mix or it could kill the yeast. Make sure you knead the dough for the full five minutes. Kneadingthe dough makes the rolls light, airy, and chewy. It’s a crucial step in making these. Without well-developed gluten, the rolls would be flat and tough. And last but not least, let the rolls rise for the full amount! Trust me, it’s worth it! If you want these for breakfast and don’t want to wake up at 5am, make them the night before, refrigerate them, and then heat them up in the morning. 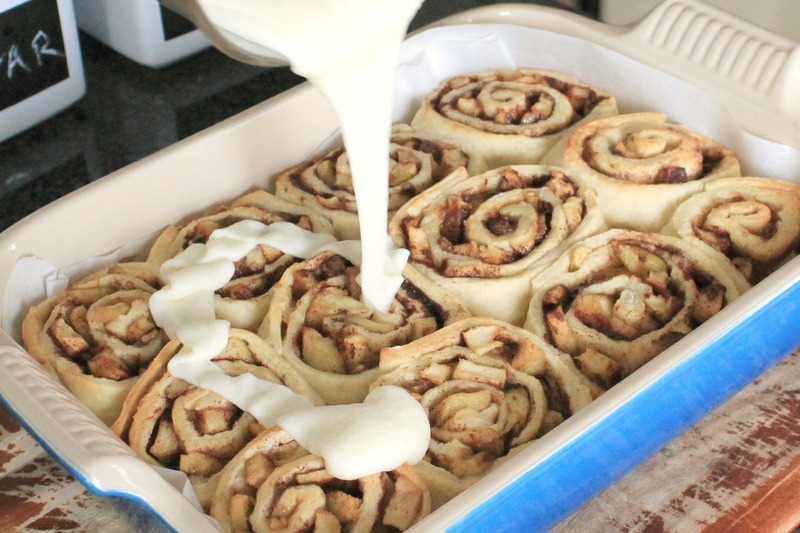 Two amazing sweet treats combine to make these delicious rolls. Make them for breakfast, dessert, or just because. In the mixing bowl of a stand mixer using the dough hook attachment, (or a large mixing bowl with an electric mixer) add scalded milk, melted butter, egg, remaining sugar, and salt and mix on low speed until combined. Add half of the flour and mix until smooth. Add yeast mixture and continue to mix on low. Slowly add the remaining flour until fully incorporated. While dough is rising, make the filling. Heat 4 tablespoons of the butter and white sugar in a large skillet, then add the apples. Sauté until apples are slightly caramelized but still al-dente. Remove from heat and strain over a bowl. Leave in strainer until you need them to let excess water drain out (see tip 1 above). When dough has risen, remove cover and, using your fist, punch the dough down and remove from the bowl. Roll out on a well-floured surface into a 16x24 inch rectangle and spread the remaining 2 tablespoons of melted butter almost out to the edges, but not quite. Spread the apple mixture over the brown sugar as evenly as you can. Roll into a log, starting from one end to the other, lengthwise, so the log is 24 inches. 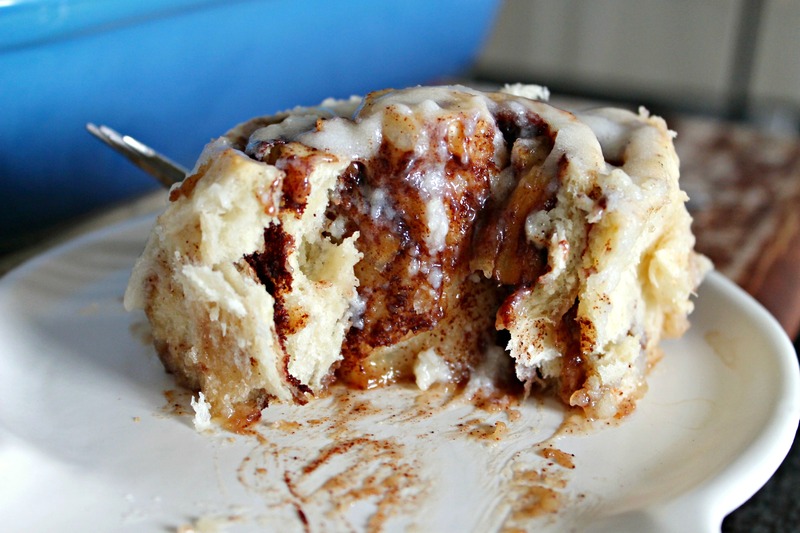 Using a serrated knife, gently cut 2 inch slices with a sawing motion (try not to push too hard to pinch the dough), this will give you 12 cinnamon rolls. Quick tip: if you don’t want to measure 2 inches out for every roll, cut the log in half, then cut each piece in half again. You have 4 pieces now. Then cut each fourth into 3 pieces. Now you have twelve even slices. Line a 9x13 baking pan with parchment paper and butter the parchment. If you want your cinnamon rolls in a round shape, place the cinnamon roll slices close together, but not touching, in the pan. I like mine to be squished together so that they become a rectangle. So I let them touch. Cover with plastic wrap and let rise until the dough is doubled, 1½-2 hours. When the rolls have 20 minutes left to rise, preheat the oven to 375°F. Bake for about 20-22 minutes, being careful not to over-bake them. 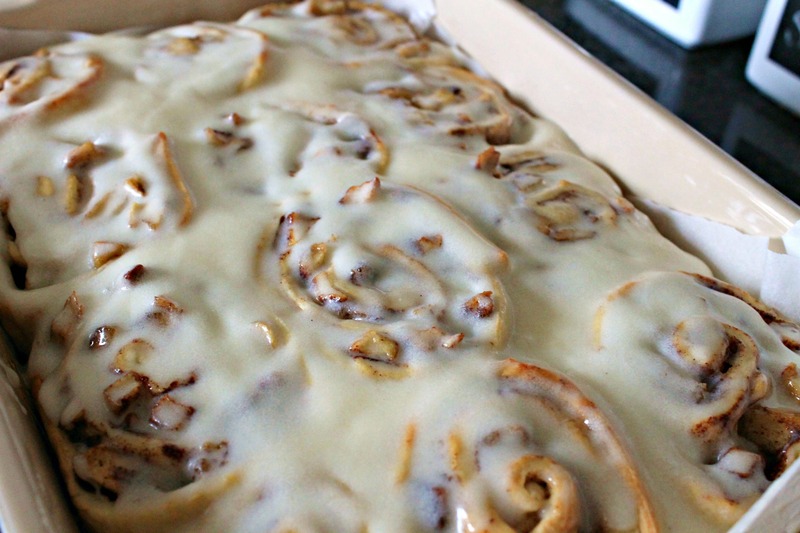 When cinnamon rolls come out of the oven, let them cool for 10 minutes. Pour the icing over the top and spread over all the rolls. Serve warm. Can these be made ahead and cooked in the morning? I wanted to make them ahead the night before and bake them and bring them to work fresh for my crew to enjoy! Yes! You can make them, let them rise a second time and then refrigerate overnight before baking. Bake them in the morning and then serve! So, strain the apples over a bowl, and then what do you do with whatever is in that bowl? is it used? Isn’t that all the good stuff? or did it soak into the apples? Just realized my question is answered in the instructions. Sorry! i cant wait to try this recipe! No worries! Can’t wait to hear how it went! Hi Sharon ,can I knead in my Kitchen aid mixer or does it need my hands assistance? Yes of course! I just like to knead by hand because my Kitchen aid goes wild when I knead with it. I saw your comment on my site, clicked on your site and OMG. Shouldn’t be legal to view your site at work at noon. These look incredible. Wow. Haha! And believe it or not, they taste even better. Thanks for stopping by! Thanks for the love! Glad you like it! High five, girl! Hope you like them! These sound and look heavenly! You’re combining two things I love:) Definitely pinned for later! And it’s just in time for fall! Hope you get a chance to make them this season! Thanks for the love!